This government run refuge is set in an old house just on the outskirts of Deia village, along the GR 221. It offers 32 beds in 4 rooms; breakfast and dinner is served, and lunch packs are available.Rates are 11 euros per bed per night and 8.5 euro per meal, bedding and towels are as per usual extra. This well situated refuge boast good facilities and is probably the only cheap accommodation in Deia. It can get very busy so book ahead through Refuge Can Boi website here. This is also a government run refuge, set on the coast in an ancient signal station just to the west of Port de Soller, close to the lighthouse. The refuge offers 30 dorm beds, breakfast and dinner is served and packed lunches are available. Prices are the standard 11 euros per person with dinners from 8.5 euros. Note that the refuge is quite a way from Soller town and about a 30 minutes walk from the center of Port de Soller, though those coming on the short stage from Deia will have ample free time to wander up to town and back before the 10 pm curfew. You can view details on the Consell de Mallorca website and book accommodation ahead on the refuge de la Muleta booking page. This is probably one of the most rural refuge of the large GR 221 chain. it offers beds , as well as breakfast, dinner an lunch. It is a great stopover spot along the GR 221 between Soller and LLuc, located in a magnificient mountain setting at 550 meters above sea level, a long way away from any car traffic or lived in farmstead. 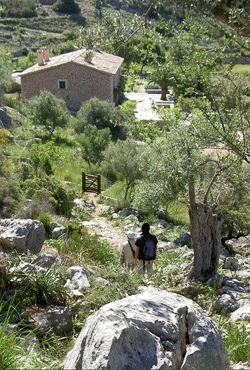 Note that the stage from Port de Soller to Tossals Verds is one of the longest on the dry stone route, and takes a very full day to complete. The Consell de Mallorca webpage on Tossals Verds provides some information, and double bedrooms can be booked through the refuge booking page. Its is unclear if the refuge has fully reopened after extensive repairs in the last year, so check before hand. A number of alternatives lodgings have been named by the consell de Mallorca in this PDF. though most of the suggestions are unpractical. The idea of returning to Port de Soller from Cuber using bus service 354 in the evening, and using the same bus to return to Cuber the next morning is nevertheless viable, as is the one to take an early morning bus from Port de Soller to Binniaraix and hike from there to Lluc via Cuber, Font des Noguer and font des Prat in a direct line, a long but manageable day hike. An interesting, little known alternative for the arduous walker is to hike Biniaraix/ Barranc/ L'Ofre/ Pas de na Maria/ Coma Sema/ Orient/ Castel d'Alaro on day one and Castel d'Alaro/ Solleric/ Tossals Verds/ Font des Prats/ Lluc on day two. Note that there is a right of way issue when trying to join the Solleric estate from Castel d'Alaro in a straight line, so these are very, very long days. 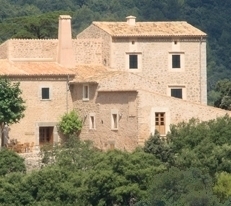 ﻿Situated high above Alaro village, the Inn at the castle of Alaro is run by the municipality of Alaro and the diocese of Mallorca. It is somehow a bit off the Gr 221 and therefore less popular with foreign hikers but offers 30 dorm beds for 12 euros each, as well as breakfast, lunch and dinner. Many will choose to take a stroll down to island famous Es Verger restaurant (The Lamb Restaurant) for early dinner, 30 minutes away. The Hostel offers great views, a bar, secluded but comfortable facilities and is a good stop over choice. Bookings can be made through the Hostelleria d'Alaro website. Situated at the very heart of the Sera de Tramuntana, a very short distance from the imposing Lluc monastery, son Amer is the largest of the government refuge in the Serra. It offer 52 beds in dorms/ rooms of various sizes. Food is also available. The refuge de son Amer costs the usual 11 euros per night, and can be booked on the Consell de Mallorca refuge booking page Note that the Lluc area is very popular with Mallorquin people during weekend and fiesta, and that it can get very busy up there. It is however, recommended to be in the area on a Sunday to complete the Puig Roi loop walk, only accessible on Sundays because of right of way issues. There are many other day walks out of Lluc that might make a few nights stay worthwhile. At the eastern extremity of the GR221, the refuge de Pont Roma lies on the outskirts of Pollensa village, close to the Roman Bridge. The building is a ﻿recently ﻿converted slaughter house, though little can be seen indicating the original use of the building. Rates are the standard 11 euros a night, food is served, and there are 38 beds available in 5 dorms. It is a good base for walks towards formentar, along the Serra de Cavalls Bernat and towards Mortix, Val des Ternelles and the Cuculla. The Refuge de Pont Roma is the starting or finishing point for most GR 221 hiking jollies. IBANAT, the Natural Institute of the Balearic Island owns and makes available to the public half a dozen huts in the Serra de Tramuntana. These provide basic shelter, usually have no electricity and are on the rustic side. They are also very cheap, at 6 euros per person per night. This is where the good news ends. you have to pick up the key from a designated locations usually miles away and return it there no more than 24 hrs after checkout. You have to have at least 50% occupancy; the online booking system will only let you book complete huts. Gorg Blau, by the other reservoir, key pick up and drop off at Lluc. The houses of Binifaldo are guarded and maybe of more practical use; they are fairly close to Son Amer, so it might not be worth the hassle. There is also a brand new refuge in Sa Calobra run by the municipality of Escorca offering accommodation for up to 10 people. The refuge has to be booked in full for a minimum of two nights and costs 100 Euros a night. This is actually a bargain, as the refuge is the only accommodation option in sa Calobra and is in prime position right above the bay's tuquoise waters. The refuge can be booked up to 2 months ahead and seems always pretty full on weekends. Ibanat also runs three refuges in the Parc National du Llevant, situated to the north east of Arta. All three are guarded, and unlike other Ibanat refuges in the Serra de Tramuntana, two of them can easily be booked by the room or bed. All three are within an hours walk from each other. For hikers without their own transport, the closest public transport access point is Arta, from where it will take 4 hrs at least to reach the refuge de S'Arenalet on the beach at the heart of the parc. The refuge des Oguers, 20 minutes away from the beach with nice views on the sea can only be booked whole (5 to 10 persons, 200 Euros). This is by far the best located and the most popular of all of the park's refuges, because of its superb situation close to a sandy beach right on the coast, reached in about two hours from the park's main parking area. It offers three double rooms and four quadruple rooms. There is no electricity, only cold non potable water and a food transport/ delivery service, No food is available locally, so hikers wishing to spend some time here should bring their own provisions. The refuge can be booked through the Ibanat refuge booking site, and costs 40 euros a double per night or 60 euros for a quad room. This refuge is some 30 to 45 minutes away from the sea and has 5 double rooms available, all with ensuite bathrooms, that can be individually booked. There is a kitchen with a wood stove, and a daily food and drink delivery service. It takes a little more than hour to reach the refuge from the park's main car park. Follow this link to the refuge de s'Alzina webpage.